I have a lot of things on my sewing table at the moment... none of them one hundred percent complete. Coming up here at allie J. from left to right: a nightgown, a cut-out sundress, a tiki paradise dress (thanks y'all for your help), and a gingham top, made with the some of the worst printed gingham I've ever seen. 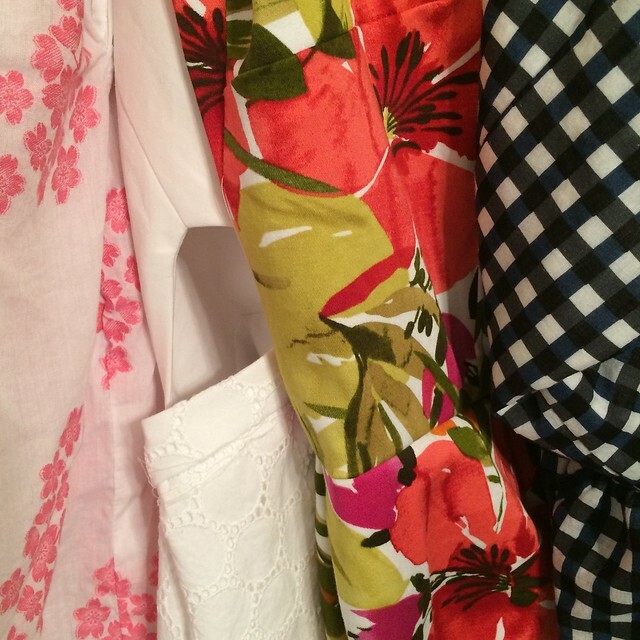 What's on your sewing table--anything you love? anything you hate already (I hope not, but it happens!)? ps: i wasn't kidding about that gingham. I just set aside my one ufo again. Ive changed my mind on a color and need to purchase some new fabric. I have a strict policy against ufos due to a history of them languishing. Do I see a Bonnell in white? Good guess, you're close! I did use the Bonnell cut-outs! I'm making a liberty bruyere, some ultimate trousers, a jersey dress and some ginger jeans! I'm making a "very easy vogue" sundress but it's turning out to be anything but. Hope to have it finished this weekend. You can check out the final project at seecarmensew.wordpress.com. If you can fit the notoriously-terrible-to-fit Peony, I'm sure you can tackle your sundress! Good luck! oooh how exciting!! i have sooo many things to sew, including a bunch of 60s/70s stuff and some Japanese sewing book type dresses and NaniIRO fabric to go with it! i must credit you with turning me on to Miss Matatabi, I've bought so much fabric from her in the last month! The Japanese fabric she stocks is all so beautiful, I want all of it. I've never made any japanese sewing book clothes but my mom has one of those books so I ought to look through it!